A linear vent and flows to the southeast of Zunil Crater. This is located within the Elysium quadrangle on Mars, a region with a volcanic past that for which we can still see evidence of old lava flows. 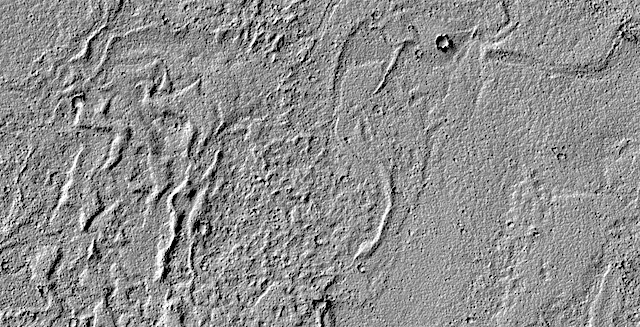 This entry was posted in Reports and tagged Beautiful Mars, Elysium Planitia, High Resolution Imaging Science Experiment, HiRISE, lava flows, Mars Reconnaissance Orbiter, MRO, NASA, University of Arizona, volcanic vents, volcanics, Zunil Crater. Bookmark the permalink.